What do Our Conversation Hearts Say About Us? Whatever your food news source, you’re probably expecting a conversation heart shortage in 2019. A trip down any candy aisle should reassure you that although the factory that makes Sweethearts candies closed in 2018, plenty of other candy companies managed to fill the shelves. The only reason for panic is if you do find a box of Sweethearts candies on a store shelf in 2019, because they’re likely to be stale. And may or may not have been produced in a factory with rodent problems. The real question is not whether or not there will be enough candy (there will), but why we are so concerned with a potential shortage. I venture that conversation hearts are popular in part for what they tell us about ourselves. The original conversation-based candies were scalloped lozenges large enough to accommodate full sentences. At least to modern readers, more was not better. Some lozenges reassured women about their paramours and their vehicles: OH MY DEAR, DO NOT SQUEAL, YOU’RE SAFE WITH ME IN THE AUTOMOBILE. Other lozenges posed riddles, like WHY IS A STYLISH GIRL LIKE A THRIFTY HOUSEKEEPER? The answer, printed on the back of the double-sided candy, was BECAUSE SHE MAKES A BIG BUSTLE ABOUT A LITTLE WAIST. Even more lozenges offered prophecies like MARRIED IN SATIN, LOVE WILL NOT BE LASTING; MARRIED IN PINK, HE WILL TAKE TO DRINK; and MARRIED IN WHITE, YOU HAVE CHOSEN RIGHT. Casual sexism and the subtle reinforcement of emerging dress codes were not the only function of the lozenges. The temperance movement also got in the candy craze, which explains less romantic messages like MISERY, SICKNESS AND POVERTY ARE THE EFFECT OF DRUNKENNESS. Fortunately, modern heart-shaped candies require more brevity than their predecessors. In a 2011 interview with Time Magazine, then Necco marketing director Aimee Scott described candy heart real estate. Each Sweetheart could have two lines of text, with five letters on the top line and four below, though Ws required lines of four and three letters. Assuming uniformity across brands, as well as words with no Ws, the standard candy heart can hold nine characters. The most iconic of those nine character limit hearts is MARRY ME. 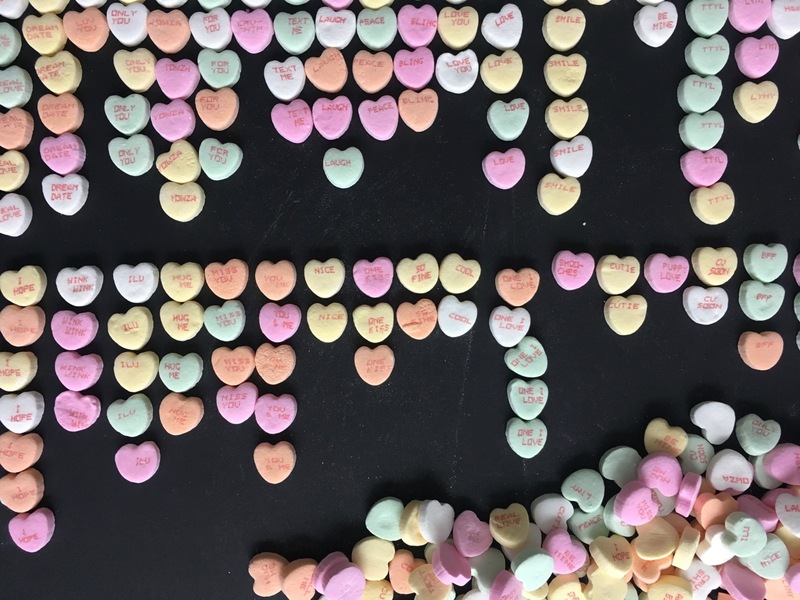 Those hoping to propose via conversation heart might want to put those plans on hold until 2020, when Spangler projects to have Sweethearts candies back in production. Those in a pinch for 2019 can always buy exorbitantly-priced Sweethearts through Amazon resellers or make their own hearts. The nine-character count has inspired decades of creativity. Sweethearts featured new themed hearts each year from 1998 to 2009, and the messages offer little windows into the world as it once was. 1998’s “Hi-Tech Hearts” (WWW.CUPID, FAX ME, BE MY ICON) show a country just falling in love with the internet, while 2003’s “Love Lessons” (WRITE ME, PEN PAL, and LET’S READ) reflect the last gasps of print culture. Those opening a bag of conversation hearts in 2019 can expect to see the mix of love and friendship from previous years. That blend of past and present is clear even in the ways a Brach’s bag refers to love, from formal declarations like LOVE, LOVE YOU and ONE I LOVE to more casual, hesitant hints like LUV YOU, ILU, and LYMY. There are the usual romantic overtures (CUTIE, FOR YOU, I HOPE, MISS YOU, NICE, ONLY YOU, SO NICE, SO FINE, SWEET, YOU & ME), and the usual suggestions of physical contact (H&K, LET’S KISS, ONE KISS, SMOOCHES), but also the abbreviated dialect of friendship (ADORBZ, AWESOME, BFF, COOL, CRUSHIN’, CU SOON, TTYL). At least one company seems content to leave the past behind. Sour Patch Kids Conversation Hearts, which have an even lower character count than the traditional heart, and just eleven phrases, reject the classics in favor of a thoroughly modern mix. The hearts celebrate friendship over romance (FRIEND, BRUH). They acknowledge that courtship is often awkward (UM HI). They offer gender-neutral terms of endearment (BAE). Like many other candy heart offerings, they sometimes display over-the-top enthusiasm (YAS). Unlike other candy heart offerings, they acknowledge that relationships aren’t void of negativity. SMH, OVR IT, and EW NO demonstrate that both love and friendships allow for disagreement. The Sour Patch hearts do offer one glimpse back to an easier, simpler time. In an emoji-saturated world, they allow the throwback emoticon : ) to accompany their LOL hearts. What most identifies Sour Patch hearts with 2019 is what’s not in the box. Traditional conversation hearts often speak in imperatives (KISS ME, HUG ME, CALL ME, EMAIL ME, TEXT ME, BE MINE). Sour Patch hearts mixes include just one such demand (DM ME), as well as responses tailored for a #metoo era: FRIEND ZONE and STOP. The shift to fewer imperative hearts hints at an exciting change. Perhaps we can take a cue from the Sour Patch and encourage our kids to view friends and baes as true partners who engage in real conversations. Next article Here’s to the Beginning of Frugal Living!